Try our muy delicioso Spanish Omelet recipe! 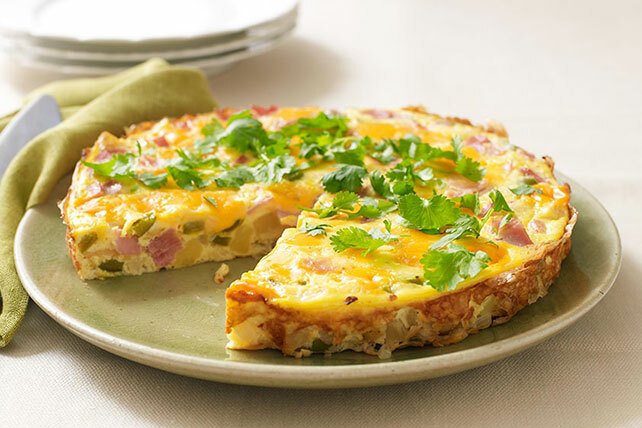 This Spanish Omelet features a flavorful mix of smoked ham, VELVEETA, garlic and chopped fresh cilantro. Cook first 3 ingredients in dressing in 10-inch ovenproof skillet on medium heat 5 min., stirring frequently. Add potatoes; cook 5 min., stirring frequently. Remove from heat. Spread potato mixture onto bottom of skillet; top with ham. Whisk eggs and milk until blended; pour over ham. Top with VELVEETA. Bake 30 min. or until center is set. Sprinkle with cilantro. Serve topped with BREAKSTONE'S or KNUDSEN Sour Cream, or TACO BELL® Thick & Chunky Salsa. If you don't have an ovenproof skillet, wrap the handle of a regular skillet with several layers of foil before using as directed. Remember that all parts of the skillet will be hot when removing it from the oven.